Corbett both receive CLF’s backing. CONGRESS | 15TH DISTRICT | In a region boasting some of the strongest labor organizations in the country, the California Labor Federation issued a rebuke Thursday by declining to endorse an incumbent Democratic congressman . The statewide labor group sidestepped Rep. Eric Swalwell and, instead, announced the endorsement of his June primary challenger, State Senate Majority Leader Ellen Corbett, also a Democrat. The news follows a less-than-convincing endorsement of Swalwell by the State Democratic Party last month. 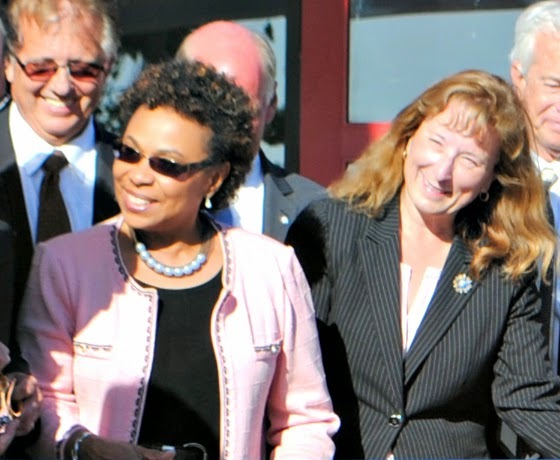 Skepticism by veteran party leaders in Alameda County regarding the first-term representative was also seen in February when Swalwell failed to garner enough votes to win the party’s pre-endorsement. Later, at the Democratic Party state convention, Swalwell eventually won the party’s backing, but Corbett still received a sizable chunk of the votes. Both tallies were uncommon across the state as almost every other incumbent sailed through the endorsement process. Curiously, Swalwell’s first year in Congress has not been unfriendly to unions, said a member of the Alameda Labor Council earlier this week. Instead, labor is still unsure about Swalwell and deferred to the candidate they know best, they said. Corbett has long received labor’s strong support during her almost two decades in public office. Practically speaking, taking into account her tepid campaign finance performance thus far, Corbett will need all the walking soldiers labor can provide. Posted in CA15, California Labor Federation, congress, Democrats, Ellen Corbett, endorsements, Eric Swalwell, incumbents, preendorsement. Bookmark the permalink. No surprises here. Bought, paid for, and owned by union whores. I'll take an independent congressMAN any day of the week. Thank you, CONGRESSMAN ERIC SWALWELL 2014! Of course they are for Corbett. As a member of the Assembly from 1998 to 2004, she voted yes on all the legislation that allowed the tremendous hikes in pensions. She vote for SB400 which opened up the flood gates for pensions. Later she voted for the same type bill that made the same boost to cities including those through out the East Bay. employees got a instant 25% boost in pensions. A few years later after everyone realized it would bankrupt the city, they reversed the pensions back to the old rate. EXCEPT, because of the bill Corbett passed, the return to the old rate only applied to new hires. Thus Corbett laid a 30 year burden on San Leandro, that will cost them dearly until the last of the current workers retires and dies. Wow, thanks Ellen for voting in legislation that allowed clearly unsustainable pension hikes. The costly gift that keeps on giving for decades. Any wonder Ellen gets the endorsement. Her vote for passage was like giving Golden Parachutes to all public employees. The cost to Oakland, Hayward, and the rest is huge even though they have now discontinued the practice,, but only for those recently hired. Proof positive that the original legislation was a horrible giveaway that cities cannot afford. He is a Democrat. The writer was making reference to the fact that he is independent of special interests–lower case 'i.' Not that he is an 'Independent,' noting party. Rather they are “decline to state” which means no party affiliation. More than one clueless politician has registered as Independent, only to discover they have joined a party in doing so. It has happened more than once locally. Then the clueless individual spends the rest of the campaign trying to explain to voters what he really intended. He usually loses in the process. I see the first post was by the sexist antiunion Troll. How does that help your candidate? It just shows how sexist some Swalwell supporters are! In the long run this will cost your candidate some votes because voters hate extremists. It is not a surprise that Labor supports Ellen Corbett because she has helped create middle class jobs in our state with her 90% support for their issues. BTW her opponent has supported Labor 80% of the time but people don't trust him because he has lied to us, flip-flopped on issues, and has not authored any significant legislation for families like Ellen Corbett has. She will be our next Congresswoman wether the Troll likes it or not. I see, how about naming some jobs Corbett has “created”. I mean jobs, other than government jobs. Jobs that pay their own way, rather than only using taxes to make work. Or do you think that creating 100 new government positions is “creating jobs”? Can't vote for Swalwell when he's got supporters like you 12:42 and 12:57 (same person). Talk about a sexist. You belong back in the 18th century. There are a lot more issues I care about than your single minded hatred of unions. I'll be voting for Ellen Corbett and so will many of my friends. I doubt your candidate will even be in the run off with the Republican now in the race. I think even you are starting to realize that. We need more people who care and are truthful in Congress. Practice saying Congresswoman Corbett. Labor and the Progressives will provide the walkers and phone bankers Corbett needs to overcome all the Corporate and Big Business money Swalwell has raised from the 1% families. She is just whorendous, whorrible, and whorrific! Guess where she's going? Sac. town, where she belongs. Lot of bloviating going on here. I can't support novices who have no idea what they are doing and are in over their head either. That's why I won't be voting for Swalwell who has authored NO meaningful bills, lies to the voters, flip-flops on issues and tries to talk about terror to scare us. He has nothing to offer! I'll be voting for the experienced and thoughtful Ellen Corbett who has authored hundreds of bills that have helped the middle and lower class. There are so many things more important than the antiunion sexist troll's hatred of unions. Love Senator Corbett and so do most of my neighbors. How come you left out your family, your cousins, your aunts and uncles, your mailman, your pastor, and 4 out of 5 members of your bridge club? Oh that's right, you began with “Love Senator Corbett”. Don't imagine that could skew your vision of reality. This endorsement is a huge one for Ellen Corbett. It almost assures her a win in the primary. The question is who will come in number two? Our current two faced Congressman or the Republican. So where is all the Union power when it comes to City of Hayward workers/labor groups? Still without a contract and still not at the table negotiating. In my days every union group would have come to Hayward and shut the town down. And they continue to call Hayward a strong union town, bologna. Ha lots of people underestimate Corbett. She was outraised and outspent by two opponents when she ran for State Senate. She knows how to campaign when the money is against. Adding labor is key to her beating Swalwell. And had not Swalwell raise funds to pay for his delegates to attend the Democratic convention, at best there would have been no endorsement. They'll head to runoff in November. Every vote that Swalwell take or does not take will be scrutinized. Let's see if he keep the balance of not alienating the Dems while keeping his Tea Party supporters. Prediction: Corbett will win a close race in November. 1:40, you bet, local voters want nothing more than to bring some of the Sacramento crowd to Washington DC to replicate their magic. We'll take Ellen Corbett who cares about families and ordinary citizens. Then she goes out and authors bill after bill that helps us that work for a living, and bill after bill for those of us who are struggling to make ends meet. In contrast our current Congressman has authored no bills to help us ordinary citizens. He does try and scare us with terror alerts to compensate for doing nothing to help us. I'll be voting for the experienced and thoughtful Ellen Corbett who has authored hundreds of bills that have helped the middle and lower class. There are so many things more important than the antiunion sexist troll's hatred of unions. This is why we need a National Right to Work Law. This is meaningless, because the San Leandro Stupid aren't in the District and the San Ramon Intelligents won't vote for that shill Corbett who is all about expanding the lazy and the welfare queens while everyone who works is taxed. About 80% of the district has been represented by Ellen Corbett at one time or another either when she was in the assembly or her current Senate seat. This is why the Swalwell stooges are so scared. Ellen should beat this liar of a congressman who has done nothing for the average citizen but take away their benefits. Swalwell's chances of winning have disappeared with lie after lie. What matters to local voters are articles like the Citizens “Swalwell's Pay To Hire Problem” or Swalwell voting to cut off unemployment benefits to now over 2 million Americans including now over 225,000 veterans and then taking his pay after saying he wouldn't. District voters will vote for Ellen Corbett because this congressman has no feeling for his average constituent. What frickin benefits has Swalwell taken away you moron? NONE. Go out and work for a living and take care of yourself instead of sucking off the Treasury like that fool Corbett. These are the benefits he has taken away stooge/staffer. Thank God. She may not have the same fundraising efforts and tactics as Eric Swalwell, but at least she has Labor backing her up.